Throughout Delaware’s rich economic history, asbestos was used as a key component for developing commerce and industry. From the time it was introduced as a multi-purpose fire retardant, to the time it was understood to be hazardous, residents and workers were exposed to toxic asbestos fibers by the hundreds each day. The heaviest exposure rates were recorded between 1920 through the late 1980’s. An exposure of as little as 1-3 months would produce life threatening health problems which would manifest 10-50 years later, essentially creating a time lapse that would place victims in a delayed state of borrowed time until symptoms would manifest. In its asbestos hay day, Delaware received and processed more than 314 tons of asbestos shipments, which in turn landed Delaware the rank of the 38th state with the highest instances of Malignant Mesothelioma. The highest asbestos exposures came from Delaware shipyards, factories, power and industrial plants, iron mills, steel mills, oil refineries, and construction sites that produced residential and commercial buildings. The use of asbestos in the Delaware construction of residential and commercial buildings lead to the exposure of teachers, children and many non-construction related personnel. Others were exposed without their knowledge through the use of products containing asbestos that were mislabeled or from products that came from a manufacturer that was unaware of the damage their products were inflicting. Workers were not only exposed without their knowledge while using equipment containing asbestos, like gloves and aprons, but also to air born particles that were inside packaging and industrial parts. Many workers unknowingly exposed their families to second hand asbestos exposure upon returning home from a job site with contaminated clothing. In Delaware alone, there have been over 416 asbestos related deaths and counting due to asbestos exposure. There have also been hundreds of locations across Delaware that have at one time reported asbestos exposure. The tragic result was the loss and suffering of the people who built Delaware. The cause was economic negligence. Delaware is also one of the only states in the US that oversees cases of those who are living internationally, but who had been exposed to asbestos during their time in the state. Delaware courts are also open to those who had been exposed internationally to products containing asbestos from US manufacturers and distributors. Those who have been exposed to asbestos and developed asbestos related diseases should contact a Delaware Mesothelioma Lawyer to get compensation for their pain and suffering. If you have lost a loved one to asbestos related cancer, you may also be entitled to compensation. A Delaware Man, who was diagnosed with Mesothelioma, won his case against multiple asbestos companies and was awarded $1,503, 075. $1.7 Million dollars was awarded on behalf of a Delaware plaintiff against multiple defendants, who died of Mesothelioma after suffering from asbestos exposure. A law firm helped an elderly Delaware Woman receive $689,580 against multiple asbestos companies after she was diagnosed with Mesothelioma. $1.4 Million Delaware Mesothelioma Verdict: For a Delaware oil refiner worker from that developed malignant Mesothelioma at age 63. 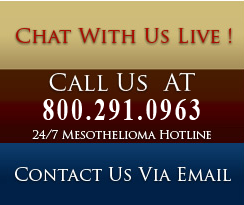 We will walk you the process of getting connected with a Delaware Mesothelioma Lawyer.